Urban sprawl may allow us to actualise the “great Aussie dream” of a big house with a big back yard, but at worst it can be a nightmare for our wildlife, with motor-vehicle accidents and predation by domestic animals resulting in countless injuries and fatalities daily. According to Robert Johnson, based at South Penrith Veterinary Clinic in Western Sydney, veterinarians play an important role in treating and rehabilitating wildlife that has come off second best in such encounters. Jane Doe, a female pink-tongued skink (Cyclodomorphus gerrardii) presented to Johnson following a dog attack in a suburban back yard. For the uninitiated, pink tongued skinks are extremely similar in appearance to Eastern Blue-Tongue lizards, distinguished by a more slender body, a narrower tail, striking cross-band markings and of course a pink – as opposed to blue – tongue, hence the name. They’re just a lot less common. They typically inhabit forests and woodlands, sheltering below leaf litter, under rocks and other crevices. Populations occur in the Blue Mountains in New South Wales, around the NSW central coast and along the Eastern coastal ranges to Cairns in Far North Queensland. Their culinary preference for snails and slugs ensures that suburban gardens are the ideal haunt for these critters – just as long as these are free of dogs and cats. 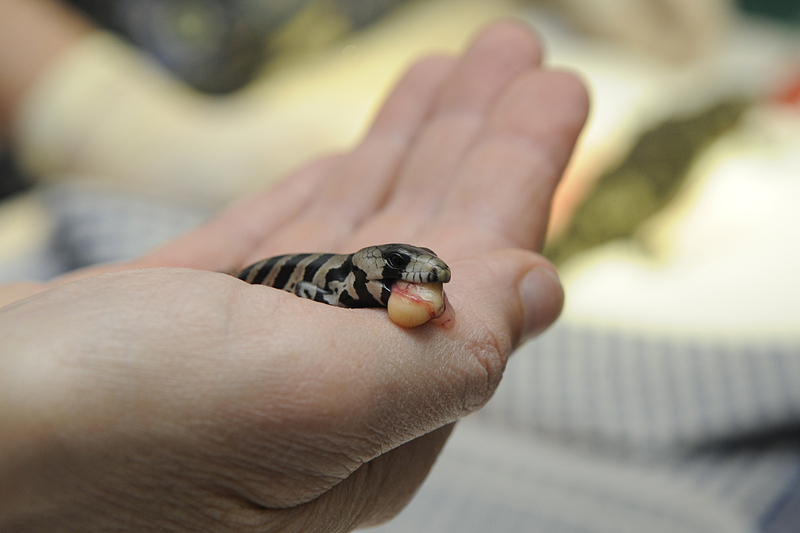 Pink tongue skinks will use their climbing skills to escape predation, but not always fast enough to avoid injury. Such was the case with Jane, who had been enjoying a meal of slugs in a lush suburban garden when she was suddenly disturbed by a curious dog. The dog picked her up in its mouth, biting into her flank. She was prised from the offending jaws immediately by the dog’s owner but the damage had been done – the bite had penetrated her coelomic cavity, and what appeared to be a solid, kidney shaped organ herniated through the defect. Jane was rushed to the clinic, where Johnson examined her. Close inspection of the hernia revealed a thin sac containing a silver and black striped mass. It wriggled. The mass, it turned out, was a live young pink tongued skink. Jane was pregnant. After a gestation period of just over 100 days, pink tongue skinks are known to produce large litters of 20-30 young (although there are reports of litters containing as many as 67 offspring). If these were to survive, Jane would require an emergency caesarean. Johnson premedicated her with a combination of morphine (2mg/kg) and midazolam (1mg/kg) via intramuscular injection. Induction can be challenging as venous access in skinks is not always easy. Intubation is difficult because of the large, slippery and in this case pink tongue obscuring view of the epiglottis which is just caudal to the main body of the tongue. Johnson routinely applies lignocaine and uses an intravenous catheter (with the stylette removed) as an endotrachael tube. In this case, he chose an 18 gauge catheter. Jane was maintained on isoflurane in oxygen using intermittent positive pressure ventilation. “You can hook them up to a ventilator but we used a trusty veterinary student called Katrina,” Johnson said. Typically he performs midline caesareans, but in this case the dog had already created a defect. “We opportunistically used the incision that the perpetrator had inflicted and went for it,” Johnson said. The wound was cleaned, prepped and extended to facilitate a flank caesarean. Exploration of the coelomic cavity revealed ruptured oviducts, with several injured and deceased young floating freely. However, the majority (27 out of 30) remained in utero, and were delivered via multiple incisions. And her offspring of course. The neonates were placed together in a Tupperware container placed on a heating pad. Gradually they came to life, slowly animating their limbs and tails. All were attached to large yellow-red placentas, approximately the size of their head. Once mobile, each neonatal skink tucked ravenously into its placenta. The wound was closed routinely with nylon skin sutures. As her young reanimated in their tiny crèche, Jane recovered slowly from an anaesthetic. Post-operatively she was kept in a warmed vivarium and given enrofloxacin every two days for antimicrobial coverage, after all the flank wound was the result of a contaminated bite. For analgesia she was given meloxicam (0.2mg/kg SC) every second day for around ten days, after which she was released back into the wild. Mum didn’t exactly pine for her offspring. After being born live and dining out on a placenta, these kids are on their own in the big, bad world. Interestingly, egg laying is more typical in reptiles that live in warmer climates. Johnson was mindful to hospitalise Jane in a temperature controlled environment until she had recovered her appetite and appeared livelier, but tries to avoid keeping reptiles in hospital for too long. By the time of release, 15 out of 30 of Jane’s offspring were thriving. Herpetologist and veterinary anatomist Glenn Shea provided information about the distribution of pink tongued skinks.